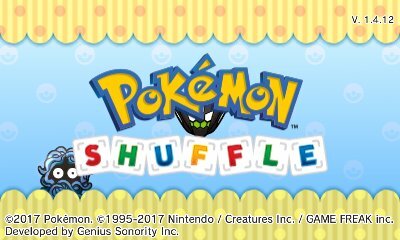 On this page, you will find all there is to know about the Software updates for Pokémon Shuffle on Nintendo 3DS (originally released on February 18th, 2015 worldwide). NB: this page was created on March 8th 2017, and therefore, we’re only listing updates released from that day onwards. Looking for updates for the Mobile version? Click here! How to update Pokémon Shuffle for the Nintendo 3DS? To check that you have the latest version of Pokémon Shuffle on Nintendo 3DS, simply launch the game: you should see the version number on the title screen, at the top right corner of the screen. Additional details: click here for more details about the new stages. You need to get this update via the check-in feature in-game. adds an option to use the same team used the last time you attempted a given stage, using the arrow on the selection screen. Additional details: click here for more details about the update. Additional notes: click here for more details about the new stages! You need to get this update via the check-in feature in-game. Additional notes: click here for more details! You need to get this update via the check-in feature in-game. Additional notes: none. You need to get this update via the check-in feature in-game. Additional notes: more details can be found here! You need to get this update via the check-in feature in-game. Additional notes: You need to get this update via the check-in feature in-game. Note: this update is also available for the Mobile version: click here for more details! Additional notes: click here for more details! Additional notes: this update is downloaded via the check-in feature in-game. the abilities Prank and Mind Zap were modified: they do not activate during Disruption Delay, or if a Pokémon is hit by a status condition.